Since he was a kid in his single digits, wearing space suits to his own birthday parties, Forest Stearns always knew that someday he would bring together his two loves: art and outer space. 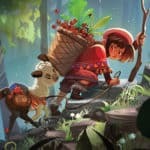 But as the newly installed director of Art at Planet Labs, an aerospace company in San Francisco that designs, builds, and launches satellites into the Earth’s orbit for scientific missions, Stearns was stumped about how to slap his art onto the side of a satellite that could withstand the extreme elements of space. Among the lineup of community speakers, there were talks on everything from redesigning healthcare to a local rock and roll group, the Frankie Bourne Band, which came on stage to perform a song called “Better Version of Me,” about reimagining the self. For Stearns, the issue was reimagining his artwork. He grew up as a graffiti and street artist in Sonora, Calif., in the foothills of Yosemite. Now he wondered how to get his art onto the body of a satellite. In the case he recounted, the art was an illustration he’d made called “The Great Migration,” a kaleidoscopic herd of animals in a headlong race to get to where their instincts were leading them. Stearns himself wasn’t quite so sure where to go. Forest Stearns at TEDxSonomaCounty. Photo by Radis Jensethawat. To solve this problem, Stearns tried a number of routes. He called up fellow artist friends. He called local art supply shops. He connected with paint experts and chemists. But mostly, he said, he turned to his notebook, where he’d logged years of artistic and creative practice. 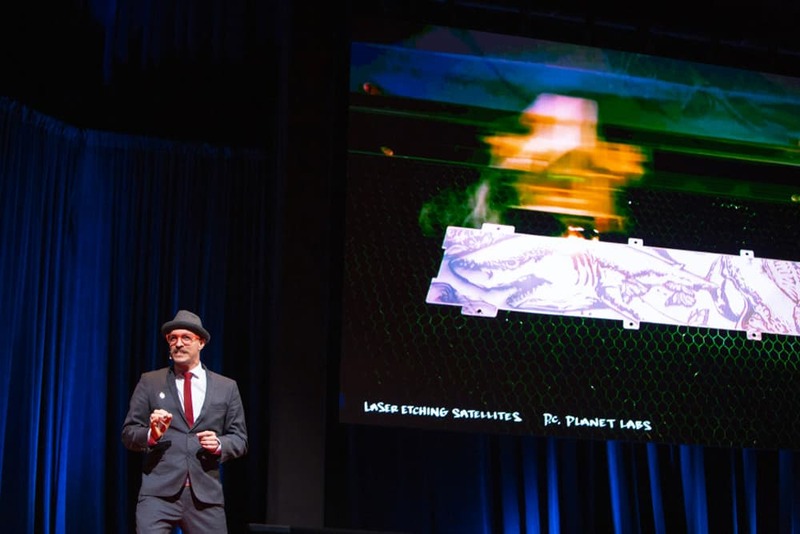 And then it hit him: His solution was not so much adding paint or ink—or even taking a space Sharpie—to the satellite, but subtracting the image through the process of laser-etching it onto satellite panels. After nearly five years—during which he created art for more than 340 satellites for Planet, where he also directed an artist-in-residence program that hosted 15 visiting artists (some of whom were fellow Academy alumni) and facilitated company-wide art nights—Stearns left Planet this past summer to continue his own solo adventure with Draweverywhere Illustration Studio, which he established nearly 20 years ago. Forest Stearns onstage at TEDx Sonoma County. 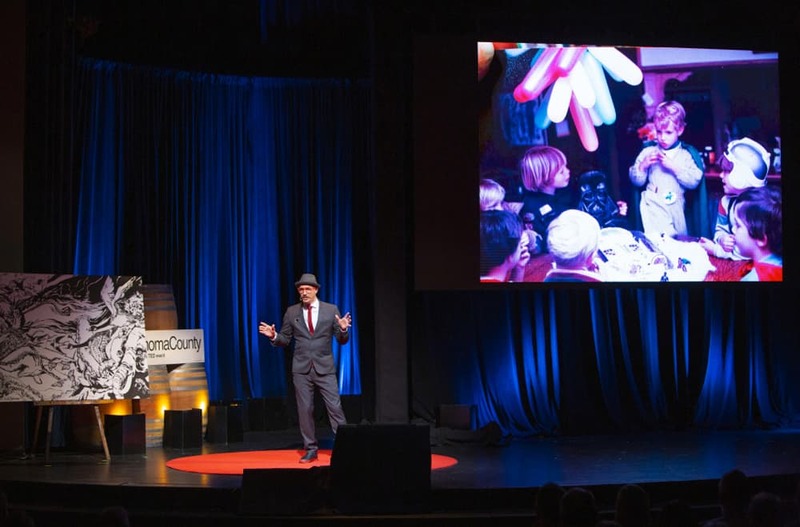 Photo by Ned Bonzi, courtesy of Tedx Sonoma County. 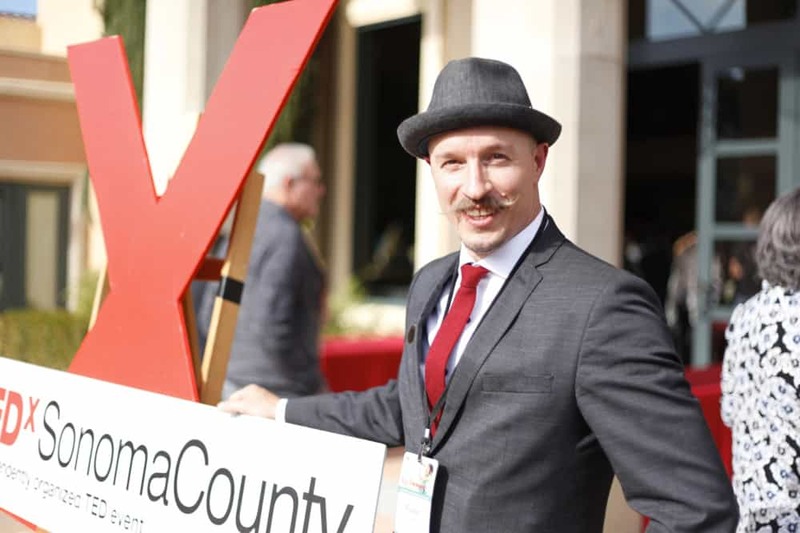 • Watch Stearns’ talk from TEDx Sonoma County here.